Although our inn is located in Yarmouth Port's historic district, you will enjoy our modern amenities like central air conditioning and complementary WiFi. The Liberty Hill Inn’s Main House accommodates five spacious rooms, from the ground floor to the third floor. All rooms have private baths and new quiet air-conditioning units, and TVs. Wi-Fi is accessible on the entire property., and free on-site parking is included with your stay. Choose a first floor room for accessibility, or a third floor room for additional quiet. Some rooms can be configured as family suites. Please call to inquire and arrange your family vacation. The Carriage House is a historic building which has been converted with all modern conveniences. The Main House and the Carriage House are only forty feet apart so there is easy access for guests. 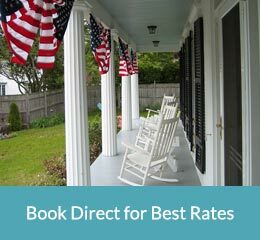 The Carriage House is handicap accessible, and the Main House may also be accessed via a ramp to the wraparound porch. Your stay at the Liberty Hill Inn bed and breakfast includes our delicious home cooked breakfast, served in our 19th century dining room. We will serve you a meal that will start your day just right for whatever Cape Cod adventure you will embark on.